Hillary Clinton's not seen as honest and trustworthy by most voters. But on Saturday the Democratic presidential front-runner spoke truths about race and gun violence in America that her Republican rivals have refused to utter after a shooter killed nine worshipers at the historic Emanuel AME church in Charleston, S.C., this week. If Clinton is to win the presidency, part of the reason will be Republicans' unwillingness to seriously confront realities that threaten the stability and strength of American society, from race and gun violence to income inequality and climate change. It's hard to come up with solutions if you refuse to identify the problems. Clinton didn't advance the ball much on the former Saturday, but she delivered on the latter — putting tremendous distance between herself and field full of Republican gun-and-race deniers. One would think the GOP would have learned this lesson from the 1990s: If you give a Clinton the obvious middle ground, she'll take it. Here's part of what she said on race. "Bodies are once again being carried out of a black church. Once again racist rhetoric has metastasized into racist violence. Now its tempting, it is tempting, to dismiss a tragedy like this as an isolated incident. To believe that in today’s America bigotry is largely behind us, that institutionalized racism no longer exists. But despite our best efforts and our highest hopes, America’s long struggle with race is far from finished." And this is part of what she said on guns, a line that drew a long round of applause from those in attendance at the U.S. Conference of Mayors in San Francisco. "I know that gun ownership is part of the fabric of a lot of law-abiding communities, but I also know that we can have common-sense gun reforms that keep weapons out of the hands of criminals and the violently unstable while respecting the rights of responsible gun owners. Clinton called the failure to implement universal background checks and restrictions on gun sales to domestic abusers, the mentally ill and people on terrorist watch lists "a rebuke to this nation we love and care about." And she called racial tension the "deeper challenge we face." 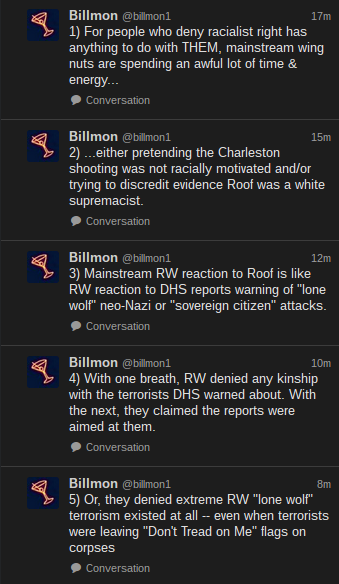 So, in the wake of Charleston, who is honest and trustworthy? It can't be these guys. In her remarks Saturday, Clinton said it's not just "kooks and Klansmen" who are responsible for racial division in America. The person who lets the racist joke go unchallenged or feels a twinge of fear at the "sight of a young black man in a hoodie" is also responsible for perpetuating racial tensions, she said. Maybe, just maybe, the presidential candidates who dare not speak of racism for fear of alienating voters who harbor deep bigotry bear some responsibility, too. It's quite a piece, refreshingly straightforward and on point.